Click on the image above to play. © 2017 SYDA Foundation®. All rights reserved. Gurumayi’s Season’s Greetings 2017—as this amazing year draws to a conclusion, you are invited to receive Gurumayi’s good wishes in the form of this beautiful gift. As always, when we receive a gift from Gurumayi in any form, there are so many teachings and sacred symbols to discover and explore, and to study, practice, assimilate, and implement. The same applies to Gurumayi's Season's Greetings 2017. A little hint: Some of the images invite us to reflect back on our study of Gurumayi’s Message for 2017. Please enjoy! 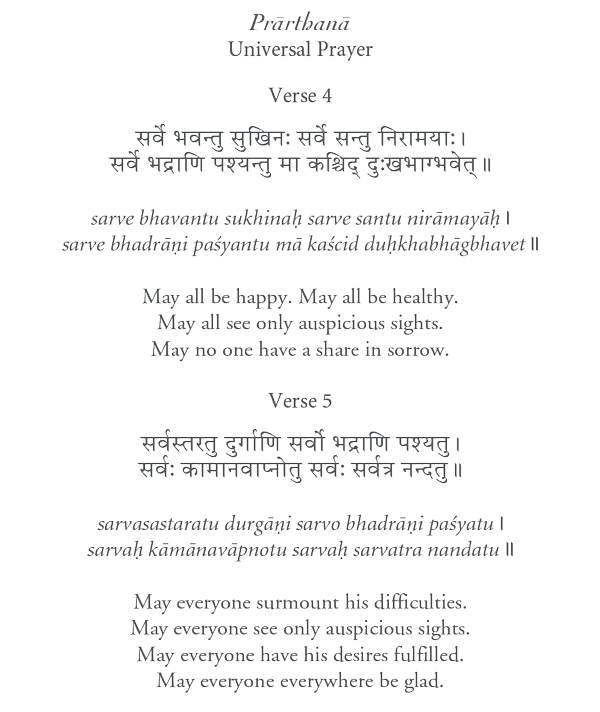 The music accompanying Gurumayi’s Season’s Greetings is the melody of verses 4 and 5 from Prārthanā, “Universal Prayer,” a hymn written in the Sanskrit language. I participated several times in viewing this magnificent and powerful Season's Greetings video. I felt pure love flowing through my heart into all my being—the love that I feel is the unity of all that exists. In this blissful meditation, sometimes the throb of breathing together with the mantra So'ham appeared by itself joyfully. Thank you, Gurumayi; you have my immense gratitude and love. What an inspiring and wonderful gift from our beloved Gurumayi. The graceful white spiraling hearts lead me to the core of the flower, the Supreme Self, and a universal feeling of oneness arises deep within me. I perceive the encompassing pulsation of the hearts as the rhythm of my own breath—Shiva’s dance within my heart and within everybody else’s heart. I see Gurumayi’s grace embracing us all within the spiral, showing us our hearts, connected through the pulsation of our own breath. Thank you, Gurumayi, for your grace and compassion. How tender and beautiful to see all the expressions of "With Love" appear above Gurumayi's golden name—and with the scintillating hearts in the background that represented to me the beating hearts of Siddha Yogis all over the world. I could feel Gurumayi's love flowing to us, and could also feel her joyful playfulness. How perfect when her name and love merged into the hearts—our hearts. One of the elements that stood out most for me in this video was the bird travelling across the universe; at the end of its body, the tail's shape reminded me of the abhaya mudra, a hand gesture symbolizing "Fear not." That bird evoked so many virtues for me, like conviction, confidence, fearlessness, and freedom. It seemed to me that the bird is distributing the gift of love to everyone and inviting us to do so too. Holding a question as I viewed the Season's Greetings 2017 video helped me to understand it more deeply. I asked myself, "What is the gift for me in this video?" As I watched, my perception expanded and loosened. I felt as if the Season's Greeting video were speaking directly to me, and telling me: Turn within. Enter your own breath. In this way, I felt that I was being brought into alignment with my very own heart. When I started watching the video of Gurumayi ji's Season's Greetings, I held my breath in awe until the end. It was for me a vibrant experience of Gurumayi ji's Message for 2017. I felt love, warmth, and energy pulsating within me. It seemed to me that the visuals were the procession of the virtues which Gurumayi ji teaches us to imbibe. The little girl reminded me of the cycle of giving and receiving love, and how this love can pervade the whole world. Each time I view this video, many teachings of Gurumayi ji come to mind; then I get immersed in them and in the love they carry throughout the day. Viewing this video is a visual treat and a treat for the heart! Thank you, Gurumayi ji, for this wonderful Season's Greetings video. The many hearts within the spiral in Gurumayi’s Season’s Greetings 2017 remind me that I am surrounded by love as I walk the path to my inner Self. They also remind me that everyone else has a heart and is walking their own path, a fact for me to remember and respect. Watching Gurumayi’s Season’s Greetings video, I recognized many of the images that were sent in as creative expressions of Gurumayi’s Message for 2017 from Siddha Yogis around the world. My heart opened with love as I enjoyed how all the artistic expressions came together to tell a story of our shared journey through this beautiful year. I have been guided deeply into the Message by Gurumayi and by everyone who contributed to the Siddha Yoga path website. Thank you, Gurumayi, for leading us into the Heart. As I looked at Gurumayi's beautiful Season’s Greetings, I was drawn in by its pulsation and movement, reminding me of the movement of the in-breath and out-breath. And I could feel the soft pulsation of breathing in and breathing out love. Then, I was amazed by the beautiful white bird with the red heart; he seemed to be leading me, with all of my learnings and transformations from 2017, into the year ahead. The sounds of the tamboura in the Season's Greetings video are like what I hear within me when I focus on the sound vibrations of my breath. The glistening colors lead me to a calm place within. And the bird flying across the screen makes me recall the metaphor of the bird with two wings, one representing grace, the other, self-effort. I feel like I am this bird, moving steadily forward, focused on sustaining the awareness of the love and freedom that exist within me. Thank you, Gurumayi, for this wonderful Season’s Greetings video. Happiest Season’s Greeting to you! As I opened the Season's Greetings from Gurumayi, the dot at the top of the beautiful AUM symbol caught my awareness and drew my attention to my third eye. I felt an immense power of love and divine energy being drawn from my third eye into my heart. It felt like my entire body had melted into the colors and the music. I became the many-petaled flower, pulsating with the rhythm, embraced by the hearts swirling around the center of the flower. My whole being was absorbed in a universe of love, filled with joy and laughter. This experience has given me the "key" to entering the universe of love. Thank you, Gurumayi, for this very special gift. As I viewed this most beautiful Season's Greetings from Gurumayi, I was mesmerized by all the creative images in their rainbow colors and their perpetual motion, and especially by the image of the little girl blowing a bubble in the shape of a heart. That is how I think of the Siddha Yoga path: connecting each heart to the Heart of all. Thank you, Gurumayi, from the bottom of my heart for all that you do for us. I am so grateful for receiving this expression of Gurumayi's love during this holiday season. By watching this video, I experienced her healing my heart "with love, con amor." It reminded me that this holiday season is a time to wrap up the past year and fly on to the new year, like the bird at the end of the video. And Gurumayi has taught me to do that in the awareness of love. As I was watching the video of Gurumayi's Season's Greetings 2017, I found the music very soothing. I was drawn within. My heart was brimming with love. I felt waves and waves of shakti rising from my heart and spreading throughout my entire being. Near the end, as the bird started flying across the screen with its beautiful heart revealed, I was filled with ecstasy, and I sent Gurumayi my own Season's Greetings with lots of love and gratitude. As the video ended, I closed my eyes and thanked Gurumayi for sending us all such a beautiful, heartwarming, and loving Season's Greetings. Opening the Siddha Yoga path website this cold December morning, I felt so good inside when reading and experiencing Gurumayi's Season's Greetings 2017. My heart opened, and I felt deep, deep love inside me. I felt like flying out into the universe and then slowly coming down again and back into my heart. Thank you, Gurumayi, for your teachings and your love.